Welcome to the Dutch Open Air Markets! When you are a tourist in Holland, Europe, do come visit us at the Dutch markets! It is the biggest open air market in Holland and it is for free! We say... If you can't find it on the Dutch markets, it probably has not been discovered yet. Every euro you spend is worth your visit. The Dutch markets are as old as the Middle Ages, even older! These days, the Dutch squares and streets would be unthinkable without the special markets. Every day, the markets are fun to see, everybody is doing there daily cheap shopping, people in search of a bargain, visitors - just pikking up the cozy atmosphere. Planning to visit Holland? Do not forget to visit the Dutch markets! For centuries, the Dutch markets ( markets - from the latin - mercatus ) have been the meeting place for buyers and sellers, and it still is! There are so many markets in Holland with such a diversity and so many different types of goods, it's a must to visit us - the cheapest bargains you will find on the Dutch Open Air Markets, no doubt about it! Almost every city has some big markets, it is the place to buy the cheapest and best goods or souvenirs and to meet a lot of multi-cultural people from all over the world. One of the most famous markets is in Amsterdam. The Rotterdam "Centrum" Market can compare with this market, but the market city Dordrecht, is the best market for the last several years! They can claim to be Holland's most lively markets! This is due in part to the enormous, colourful variety of food and cloth sales on these markets. The market "kramen" (stalls) are really nice to visit, it is a real pleasure to see, taste, smell and feel the market goods and sphere. The offerings are so varied, that the market people in Holland say: "If you cannot find it on the Dutch markets, it either does not exist or it has not been discovered yet". Whatever the time of year, there is always a fun and nice atmosphere at the Dutch markets. The Dutch markets have a great history. The Dutch markets are the right place to start your visit in Holland and to get to know the Dutch people very well. Dutch sales men are willing to help you find the right souvenir! They are frendly and polite, just ask anyone what you would like to know about Holland and they help you in so many ways. The Dutch markets are great! 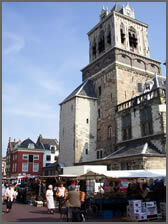 So many historical marketplaces are in Holland, it is inpossible to name them all but, for example, the markets in the city of The Hague, the market square in Groningen, the market "grote markt Haarlem", the market in Den Bosch, the market in Maastricht or the market in Utrecht are worth your visit! Lots of Dutch markets have been in the center of the city for a long time, they give you a good view on the old Dutch history and heritage. The Dutch are proud to show you their markets and they are pleased to show you the Dutch souvenirs. It is a great experiance for you whenever you come and visit us at the lokal town market. It realy is a must! 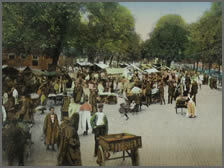 But we also have horse markets in Holland, fleamarkets, the popular yearmarkets or the braderie, sometimes in combination with a fancyfair market... There are so many markets, just come today and visit the markets in Holland! Cheese, wooden shoe's, old Delft paintings and... you might even find an old "Rembrandt van Rijn" at the secondhand markets. Do come visit the Dutch markets whenever you are in Holland, Europe!